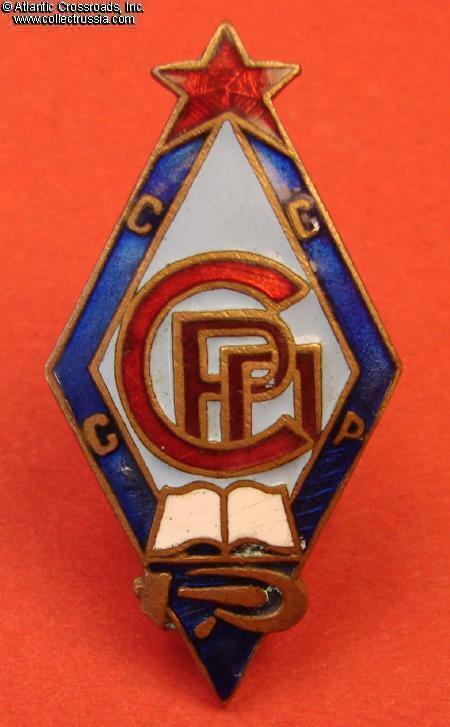 Trade Union of Education, membership badge, Type 4, 1922 through late 1920s. 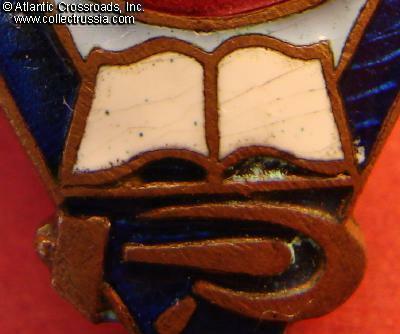 In brass and enamels; 38.9 x 19.9 mm. Well proportioned design influenced by Constructivist style, still popular in those years. Note a very unusual, compressed depiction of the hammer and sickle emblem, at the bottom. The red cipher in the centre is Cyrillic acronym of the Trade Union, "SRP". The small letters in the blue border are "SSSR" (USSR). 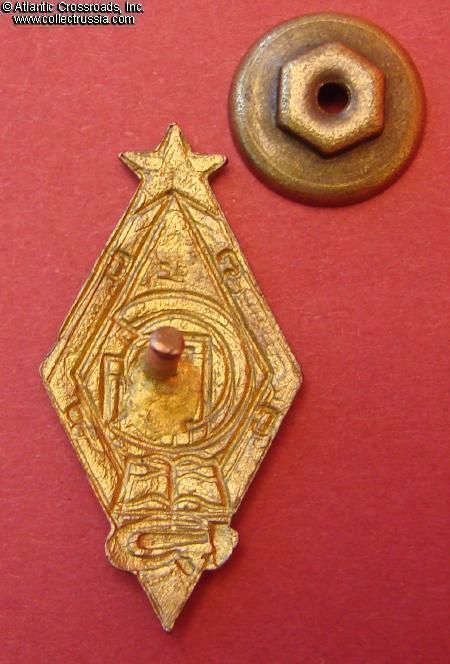 This is the larger version of the brass, diamond-shaped Trade Union of Education badge. 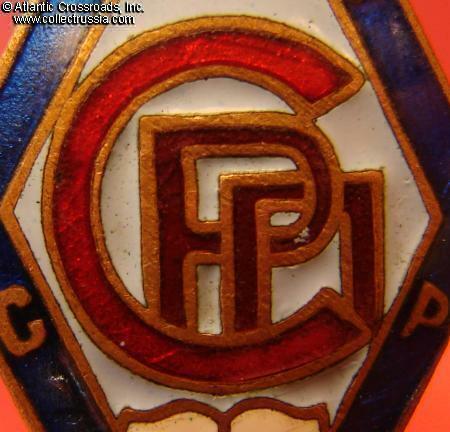 In very fine to excellent condition, outstanding for a badge of this vintage. The enamel in the lower portion has occasional hairline cracks and few small contact marks not affecting the overall appearance. There are no penetrating chips or noticeable flaking. Gold finish on the reverse is completely intact. 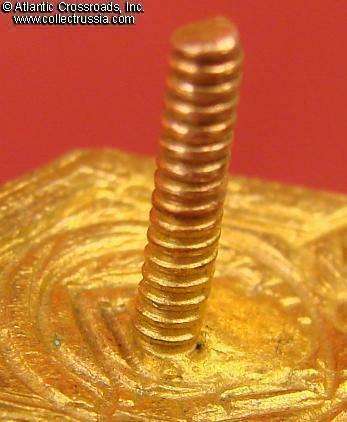 The screw post is full length, approximately 11.7 mm, and comes with scarce original screw plate. /See "Avers 8", p 277, fig. 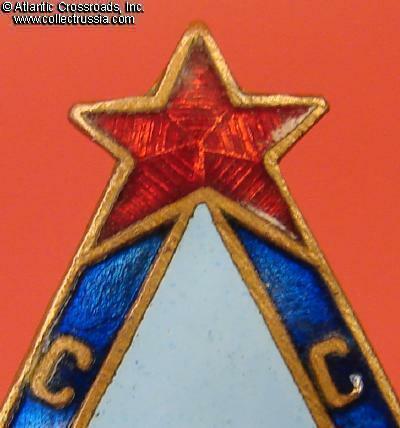 1355.b, also "Breast Badges of the USSR of the Era of Labor Victories, 1920-1940", p. 201, middle/.